Los-Angeles-via-Brooklyn twosome High Places have created quite a bit of buzz in recent years, which is no easy feat for a band that fits perfectly within the male-female, indie-electronic paradigm. 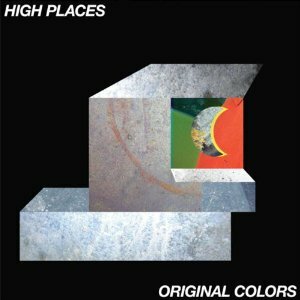 It is clear that for their newest release, Original Colors, duo Rob Barber and Mary Pearson have made a sincere effort to distinguish themselves from some of their peers, like Phantogram, Cults, and YACHT. driven electronic compositions have clearly matured, yet Pearson's vocals sometimes seem like an afterthought, particularly on the bleak opener “Year Off.” Still, on the somber “Morning Ritual,” Barber and Pearson come together harmoniously for a slightly swizzy slow jam. Original Colors' closing tracks redeem the album as a whole. On the brief-yet-sweet “Twenty-Seven,” Pearson's vocals are looped into a cathartic chorus that will leave listeners craving more. The album's send-off “Altos Lugares” draws in the listener with a simple percussive beat while electronic rhythms and subdued vocals are woven in over the course of the track, culminating in a nebulous sound. While this second full-length release from High Places is slightly lackluster compared to their previous releases, it is clear that they have a unique point-of-view. Overall, when they are on, they're really on, and I look forward to seeing what they create next.